Without conscious attention to cross-functional processes, nobody is deliberately responsible for the creation, accumulation, and delivery of value to customers and other stakeholders. The organization chart says nothing about this topic. All organizations seek to deliver value but, without a relentless, mindful focus on business processes, there is a critical gap between aspiration and reality. Too often, process improvement initiatives are ‘random acts of management’ without a systemic foundation. Organizations focused on continually improving and innovating the creation, accumulation, and delivery of customer value have process thinking embedded in culture and practice. In thinking of BPM as a management philosophy, the intent is to effect ‘process-based management’. This means that the cross-functional processes that every organization uses to create, accumulate, and deliver value are central to strategic, operational, and tactical management. To do that, the processes are identified, performance targets are set, governance mechanisms are created, and process performance improved in a process-aware culture where everyone contributes and appropriate support is provided. The required components are easily identified, and it’s not hard to imagine them all working harmoniously together in some future state, but how do we reach this nirvana? What is the trajectory from the pristine theory of everybody being ‘process-centric’, to the gritty reality of managing a real organization with all its complexities, latencies, impossible demands, and human frailties? 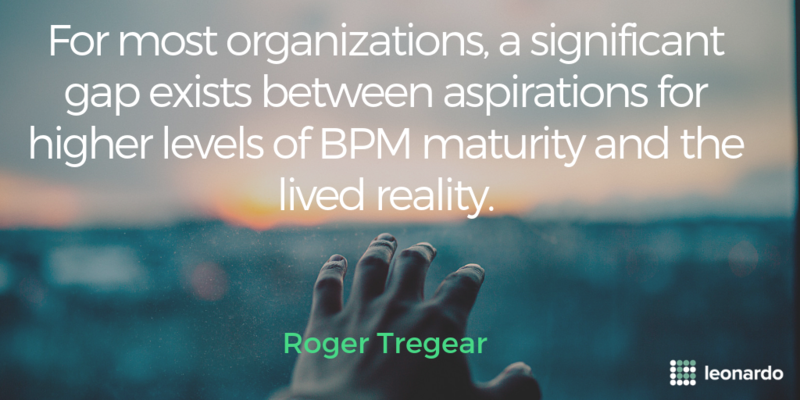 For most organizations, a significant gap exists between aspirations for higher levels of BPM maturity and the lived reality. This is not to say that crossing the chasm is too hard or too dangerous to be attempted; the lesson is that, to succeed, organizations need to understand what is involved and properly prepare for the crossing. An elegant solution is found in two virtuous circles, the Tregear Circles, that facilitate and deliver process-based management based on the 7Enablers. To their significant benefit, many organizations successfully cross the chasm, and this number is increasing. They make it to a point where process-based management is becoming the instinctive approach, and process thinking is being embedded in the organization’s culture and practice. In doing this, they have also solved the dilemma of balancing the immediate and urgent demands for performance control and improvement with the longer-term need to create a systemic approach that will pre empt and prevent the urgent problems before they have a chance to develop. This is not to say that they have reached enlightened perfection, a process nirvana. However, they have created, and increasingly entrenched, a systemic response to performance problems, innovative ideas, and operational and strategic ecosystem changes, that drives continuous improvement in the creation, accumulation, and delivery of value to customers and other stakeholders. How do they do that? Two virtuous circles deliver process-based management at high levels of BPM maturity. The author has derived general concepts from projects across a range of industries and in several different countries. Operating details vary, but the basic structures are present in successful process-based management environments. The two virtuous Tregear Circles are the PO circle (process ownership) and the PI circle (process improvement), as in Figure 1. Key activities in the PO circle are target—assess—respond. In the PI circle, the key elements are as is—to be—to do. The Tregear Circles are more than an interesting diagram. They describe a meta-model for practical process-based management, one that can be used at once and from which benefits accrue quickly. Details are discussed later, but first, an overview of each circle showing its general context and content. The PO circle is continually and deliberately testing the performance of all processes to uncover actual or emergent performance gaps driven by measurement, and innovation opportunities driven by ideas. A process performance target is set, then what is really happening is assessed, and intervention is required if the results are not what they should be or could be, or if the target should be adjusted. In a process-centric organization, this is the core of the process owner’s role. This continual sequence of target–assess–respond ensures an unrelenting focus on the management of process, and therefore organizational, performance. It centers attention on the identification and management of process-performance gaps. The repeating cycle of target—assess—respond is the drumbeat of process ownership. The PI circle is the process-improvement cycle that identifies the current state, defines the future state, and then makes evidence-based changes required to close prioritized performance gaps. Where actual or emergent process performance requires intervention, either because of deteriorating performance or an opportunity to innovate process execution, it is the PI circle that delivers process change. Conscious process-management activity starts with the PO circle. The requirement is to be continually aware of performance gaps or opportunities to challenge the status quo, and making evidence-based decisions about which gaps need to be partially or completely closed, and in what order. The PO circle turns with a cadence appropriate to the frequency of the process execution. The PI circle turns with a speed appropriate to the type of process intervention underway. While the PO circle triggers the PI circle, they act asynchronously. The real benefit of continuous improvement comes after the easy changes have been made—and this demands not just the PI circle to deliver changes, but also the PO circle to continue to uncover the anomalies and opportunities. Having constant system of process assessment in place, that is, having the PO circle turning, provides a continuous and integrated mechanism to test what benefits have been realized via process improvement, that is, by having the PI circle turning. The reliable closing of this continuous feedback loop is inherent in the operation of the circles. Creating the circumstance where the two circles are ‘consistently working well’ is not a trivial exercise—but once achieved, there is a mental and physical fly-wheel effect that is continually boosting process performance; that is, continually assessing and adjusting the cost-effective delivery of value to customers and other stakeholders. The circles also give shape and substance to the various roles involved in process-based management. The PO circle defines process owner accountabilities. Too many organizations appear to define success for a process owner as having achieved perfection; ‘we have no problems to fix, no opportunities to fulfill’. Whereas successful application of the PO circle means the process owner continually finds problems to fix and opportunities to realize. When the PO circle turns, it deliberately uncovers possibilities for continuous process improvement. Those who put forward ideas for change, and those who play a role in establishing the business requirements for performance of a process, are also well involved in the PO circle. In the PI circle, the process-improvement project roles are defined, separating process improvement work from the continuous work of process management. Target–assess–respond is the essential cycle of process-based management. Identify a process and set a performance target, assess actual performance, and respond if intervention is warranted, either to improve performance or change the target. This is the main game; all process management and process improvement comes down to this. If processes are not being improved, sometimes with radical effect, then all this activity is wasted. Process-based management is both as simple and as complicated as the target–assess–respond circle. For many organizations and their people, this is a new way of thinking and working. The difference is not only in the idea of assessing and reporting, but also in assessing and reporting business-process performance, rather than the performance of organizational units alone; that is, focusing on value-creation chains from the process architecture, not just resource-management objects from the organization chart. As is–to be–to do is the classic process-improvement cycle—understand the current situation, define the target, and design the activities to achieve the change. This where the change enabler from the 7Enablers operates. An important aspect, illustrated by the circle, is that the start and end must be with the ‘as is’. The objective is not to design the ‘to be’, nor is it enough to create the plans for change (to do). What is required is not just a ‘to be’ or a ‘to do’, but a new ‘as is’. That seems a simple enough idea, perhaps just playing with words, but the reality is that too many process-improvement projects make more recommendations than changes. Successful changes are made here in the PI circle. The results of those changes are assessed in the always-turning PO circle. Whether Lean, Six Sigma, BPTrends Redesign, or another process analysis and improvement approach is used, the PI circle objective is to give effect to the response wanted by the PO circle. In the context of the Tregear Circles, the PI circle is methodology-agnostic. The Tregear Circles show the simplicity and the complexity of process-based management. Turning together, they achieve what many organizations struggle to achieve when focusing on just one alone. Reflecting the execution of an organization’s strategy, the PO circle defines the essential role of management: to continually uncover and resolve current and emergent performance concerns, and to capitalize on opportunities. Responding to these outcomes, the PI circle seeks, finds, and makes the changes required to close the performance gaps and realize the benefits. Once established, and when well maintained, the ‘circular momentum’ aids continuous improvement and resists any other influences that might act to slow it down. With the Tregear Circles turning, strategy is enacted through continually improved and actively managed business processes.